Keith J. Grant stops by to talk with Christopher about his new book, CSS in Depth, and what he’s discovered about the design language of the web during the writing process. Simon St. Laurent stops by the show to discuss with Christopher the winners of Comic-Con San Diego, the finding of a new shape, and the bittersweet tanking of social media companies Twitter and Facebook failing to grow revenue off our data. Co-founder of Mule Design, Erika Hall, joins Christopher to talk about her new book, Conversational Design, and also about how Mule Design works with teams to communicate and design better and more collaboratively. Simon St. Laurent joins Christopher Schmitt to discuss Amazon recording personal conversations, Uber closing self-driving operations, the rise of GDPR, the new “Solo” Star Wars movie, and Twitter mixing it up with politics. Christopher Schmitt and Simon St. Laurent talk about your cousin’s DNA and the legal system, Apple getting out of routers, Avengers Infinity War, getting off Google Analytics and Facebook, and Flickr getting bought by Smugmug. Joined with Simon St. Laurent in talking with Dr. Sean Brannon and Paul Schmitt. Dr. Brannon is Professor from the Dept. of Mechanical and Nuclear Engineering at The Pennsylvania State University; affiliated faculty to the Thomas D. Larson Transportation Institute (LTI); and Director of the Intelligent Vehicles and Systems Research Group. Paul Schmitt is Director of Automated Vehicles at MassRobotics and an invited expert to the White House on Autonomous Vehicles. Rachel Andrew returns! Rachel is a sought out expert on web design layout technologies like CSS Grid and Flexbox, an invited expert to CSS Working Group, and author of several books. Her latest book, The New CSS Layout, is out now from A Book Apart. Joined with Simon St. Laurent in talking with Aral Balkan. Aral is a cyborg rights activist and one-third of Ind.ie, a small non-profit organization working for social justice in the digital age. At Ind.ie, he works on Better, a privacy tool that stops trackers while you are surfing the web on Safari browser on the iPhone, iPad, and Mac. Jason Pamental is the author of Responsive Typography from O’Reilly Media. He recently won one of the Best Of awards for his web typography talk at the annual CSS Dev Conference 2017. The Internet’s Christopher Schmitt is out, but that doesn’t mean you can’t enjoy the Best of Non Breaking Space Show. In this volume, hear about Matt Griffen landing Tim Berners-Lee as a guest star in his web documentary, What Comes Next is the Future; how Dan Jurgens and DC Comics created international news by killing off Superman, the first time; what the Big Bang looks like with Dr. Christine Corbett Moran; and learn why to avoid hourly billing in your business by Jonathan Stark. Discovery doesn’t get Star Trek or maybe it’s the biggest con since Star Trek II? Meanwhile, iPhone X’s Notch changes how we view web design and more in this week’s Top (n+1) News Stories of the Week! Christopher Schmitt is out, but that doesn’t mean you can’t enjoy the time Nicole Sullivan talked about how she read W3C specs for fun, Lou Rosenfeld trying not to start a war between IA vs. UX, and how Jessica Hische became a success. Nathan Curtis co-founded EightShapes in 2006 and is passionate about interaction design, information architecture, and front-end development. He specializes in design systems consulting for teams large and small, regularly writing about and speaking at events worldwide. Co-hosting this week is Micah Godbolt, Senior Design Developer at Microsoft. Laura Kalbag is a designer from the UK. She’s one-third of Ind.ie, a tiny social enterprise working for social justice in the digital age. At Ind.ie, Laura works on a web privacy tool called Better. Her first book, Accessibility for Everyone, is published by A Book Apart. Peter Nowell is an independent designer, whose clients include Apple, Flinto, and Juice Shop. Peter is also the creator of Sketch Master, a set of online video courses for learning Sketch app. Jina Anne and Michah Godbolt are back on the show, but together for the first time, to talk about design systems, how they are using design systems at their respective jobs, and what is the state of design systems. Kirupa Chinnathambi works as a Program Manager in the Web Platform team at Microsoft. His latest book, Creating Web Animations published by O’Reilly Media, examines how animations are made in today’s user interfaces. Lara Hogan is an engineering director at Etsy and the author of Designing for Performance and the coauthor of Building a Device Lab. Her latest book, Demystifying Public Speaking, tackles every step involved in taking the podium and delivering the killer presentation. Amazon has the best week ever. Meanwhile, we’re not good enough for Apple Maps, so Apple’s making self-driving cars? What could go wrong and more in this week’s Top (n+1) News Stories of the Week! Dan Mall — What is Your Hourly Rate? Dan Mall returns! Dan is the director of SuperFriendly, a design collaborative, and author of a new book about the approaches professionals can take to valuing their project rates called Pricing Design, which published by A Book Apart. Harry Roberts is an award-winning Consultant Front-end Architect, writer, and speaker from the UK. Roberts is often asked for his advice by web teams to help make their CSS better organized and more efficient. Dan Brown is co-founder of EightShapes, a UX design discovery shop that serves clients in healthcare, education, not-for-profit and high-tech. He’s recently written a book called, Practical Design Discovery, published by A Book Apart. J.M. DeMatteis is an Eisner award-winning writer and editor with more than thirty years experience in comic books, graphic novels, television, film, and prose. He stops by the show to talk about his process, how things have changed in comics over the years, and the services he provides to help other writers. Oliver Lindberg is a freelance editor and content consultant, founder of the new Pixel Pioneers conference, co-founder and curator of Generate Conference, and former editor of Net magazine. The state of Angular, Apple’s self-driving vehicles, parking spaces in space, American Dream is stuck in a rut, and The Last Jedi teaser trailer reaching over 20 million views. Whitney is Co-Director of Civic Design and is an expert in user research, user experience, and usability, with a passion for clear communication. She’s the author of three books: A Web for Everyone, Storytelling in User Experience, and Global UX. Val Head is a web animation expert and author with a talent for getting designers and developers alike excited about the power of animation. She’s the author of Designing Interface Animation and teaches CSS Animation on lynda.com. Dr. Susan Weinschenk is a behavioral psychologist who has been working in the field of design and user experience. She is the author of How To Get People To Do Stuff, Neuro Web Design: What Makes Them Click? and 100 Things Every Designer Needs to Know About People. Lainey Feingold is the author of Structured Negotiation published by the American Bar Association that explores an alternative dispute resolution process she’s used throughout her work as a disability rights lawyer. Through structured negotiation, she has collaborated with Target, CVS, Major League Baseball, Wal-Mart, and many other organizations in representing disabled people seeking full participation that our society has to offer. Kristofer Layon is the Principal Interaction Designer at Honeywell. Before then, Kristofer directed the MinneWebCon in 2008 until 2011. Steve Portigal is the founder and principal of Portigal Consulting, a boutique firm that brings together user research, design and business strategy. Steve is the author of Interviewing Users: How to Uncover Compelling Insights and Doorbells, Danger, and Dead Batteries: User Research War Stories. A highly sought-after speaker, Steve Krug is a usability consultant who has more than 20 years of experience as a user advocate for companies like Apple, Netscape, AOL, Lexus, and others. He is best known for his book Don’t Make Me Think about human-computer interaction and web usability. His second book, Rocket Surgery Made Easy, is a DIY guide for Finding and fixing usability problems. Director at South by Southwest (SXSW) Interactive Festival, Hugh Forrest has overseen it from its inception in the mid-90s to see it turn into a mega-conference, hosting a sitting President of the United States as keynote speaker. Dudley Storey is a Smashing Magazine contributing editor, teacher and speaker, his new book Using SVG with CSS3 and HTML5 is scheduled to be released later this Spring. Jonathan Stark — How Much Should I Charge Clients? The author of Hourly Billing is Nuts, Jonathan Stark, joins us to about charging clients what your worth or, what could be more beneficial, charging what the work is worth to your customers. Twitter filled with Star Wars Bots; Amazon wants storefronts in virtual reality, the pain of numbering software releases, shady UX practices, and the most popular tech skills for the year, and the current asking price for 30 seconds of the Super Bowl™. Brad Frost is the web designer who created the mental model of Atomic Design. He’s a sought-after designer, speaker, and consultant about responsive design. His new book Atomic Design explains the concept of modular design as well as how to position it in a workflow for multi-device web developers. For our 2016 wrap-up episode, we’re presenting an exclusive recording of the traditional CSS Dev Conf 2016 Wrap Up Panel. As hour filled with lots of great questions from the audience for the incredible array of speakers. Vine is shutting down, who should buy Twitter, the story of Christopher dancing as Chewbacca, the cons of a MacBook Pro, CSS Devconf recap, Stranger Things and binging on Netflix, and walking away from The Walking Dead. Matt Vanderpol helps companies and agencies craft custom WordPress themes with an emphasis on content maintainability, performance, and responsive behavior. A special Non Breaking Space episode: Live Q&A session from the first ever ATX Web Film Series presentation. ATX Web Film Series aims to provide thought- and discussion-provoking films about the Web, Design, and Technology. From Austin, Texas, I’m Christopher Schmitt and on this episode, I’m joined with Nick Pettit. Nick is a teacher at Treehouse, an online web education company. He is also an independent virtual reality (VR) game developer. On November 15th, he releases his first major game called “Neptune Flux,” which can be experienced on VR headsets like the Oculus Rift, HTC Vive, and PlayStation VR. There are also non-VR variations of the game that can be played on PC, Mac, and PlayStation 4. Peter Olson is Director and Creative Technologist at IDEO. Before he joined IDEO, Peter was the founder of and served as a Vice President of Technology for Marvel Entertainment’s Digital Media Group. For this episode, we have the Q&A panel after the world premiere of Matt Griffin’s documentary, “What Comes Next is the Future.” The premiere took place at Code & Supply’s Abstraction conference in Pittsburgh, PA on August 18th. Panelists included Matt Griffin, Jeffrey Zeldman, Mat “Wilto” Marquis, and Val Head. In this episode, Christopher Schmitt is joined by Cecy Correa, who is an Associate Software Engineer at Return Path and is a co-organizer for Refresh Austin, a monthly web and mobile design and development meetup. In this episode, Christopher Schmitt is joined once again by Glenda Sims. Glenda is the Accessibility Practice Manager at Deque Systems helping to define accessibility and lead over 50 experts on staff. In this episode, Christopher Schmitt is joined by Dan Jurgens. Jurgens has been involved with writing and drawing comics for over 30 years including Superman, Green Arrow, Spider-Man, Thor, Captain America, and countless more as well as managing fellow creatives working on their own books for mammoth crossover events. In this episode, Christopher Schmitt is joined again by Chris Coyier. Publisher of the CSS Tricks community site, Coyier recently authored Practical SVG from A Book Apart. In this episode, Christopher Schmitt speaks with Wes Bos. Wes is a site and web applications’ Designer, Developer, Speaker, and Teacher — probably most recognizable for his online courses such as Sublime Text Power User and React For Beginners. In this episode, Christopher Schmitt is joined with Simon St. Laurent. We’re talking the CSS Containment property, SVG book by Chris Coyier, Pokemon Go, Telsa’s new masterplan, ComicCon, and the Star Trek: Beyond movie. In this show, Christopher Schmitt talks with Dave Olsen, programmer/ project manager with West Virginia University, about the recent release of Pattern Lab 2. Pattern Lab helps teams build thoughtful, pattern-driven UIs using atomic design principles. Ben Brown stops by the show for an update on bots as well as some news on a conference for bot enthusiasts to check out or submit a talk to coming up in Austin, Texas. Scott McCloud joins the show to talk about his new book, Sculpture, movies he’s enjoyed lately, his upcoming book on visual communications, presentation styles, old media vs. new media, and how comic book writing and design has changed. Rachel Andrew returns as our guest. She’s an author, international speaker, product is a web developer, speaker, co-founder of CMS Perch. She’s recently been writing and speaking about the future of web design layouts: CSS Grids and Flexbox. Based in Pittsburgh, Matt Griffin is a designer and founder of the web design consultancy Bearded. He’s a speaker, writer, educator, and an avid advocate for collaboration in design. His writing has been published by net magazine and A List Apart, where he writes the regular column on “How We Work.” Matt is the director of the upcoming documentary film What Comes Next Is the Future, the definitive documentary about the web as told by the people who build it each day. The film premiers August 2016. Dr. Leslie Jensen-Inman is a designer, speaker, author, educator, and co-founder of Center Center, a user experience design school based in Chattanooga, Tennessee. Leslie shares her research and thoughts on design, learning, leadership, and community through writing and speaking. Leslie is creative director and co-author of the book, InterACT with Web Standards: A Holistic Approach to Web Design. She writes articles for publications such as A List Apart, The Pastry Box, Ladies in Tech, and .net Magazine. She speaks at events such as Build, Converge, SXSWi, Madison+, Blend, UXCamp DC, In Control, Fronteers, A Web Afternoon, and Web Directions South. The co-founders of Bright Umbrella, a web design and development agency, are Emily Lewis and Lea Alcantara. We talk about THRIVING a business—going BEYOND superficial marketing and sales language to talk about what worked and what did not as they grew profitable and happier. Wren Lanier is a senior product designer, speaker, and writer based out of Durham, North Carolina. Designer and strategist with a passion for creating beautiful digital products, Wren specializes in mobile design, user interface design, lean UX, information architecture, team leadership, and product strategy. Sean Vanaman is a video game designer, writer, and podcast host. He was the co-project leader and lead writer of The Walking Dead, and Puzzle Agent 2. Sean co-founded the new video game company, Campos Santo, and their first game, Firewatch, is a first person adventure that centers around the character, Henry, a man whose love life is in free fall, takes a job as a fire lookout in the Shoshone National Forest. Based out of Asheville, NC, Miles Tilmann and Rich Grillotti make up the leadership of PixelJam, an indie game development company. Since 2005, they’ve created their own video games mostly in the retro pixelation format that defined the look and feel of 1980s console games such as Gamma Bros., Dino Run, and PotatoMan Seeks The Troof. However, some games have other visual styles like Glorkian Warrior, show they can shed the retro feel and still make an engaging game. They’ve also produced mobile games for late night cable station, Adult Swim, such as Hipster Kickball and Pizza City. Micah Godbolt is a frontend architect, trainer, and speaker based out of Portland, Oregon. Micah has a book that has been recently published by O’Reilly Media called Frontend Architecture for Design Systems. From Austin, Texas, we talk with Arianne Stiles, ½ of Environments for Humans. Environments for Humans produces over a dozen of virtual front-end and UX design conferences every year as well as the first web builder conference for CSS, CSS Dev Conf, which is coming up this October in San Antonio, Texas. While Christopher Schmitt endures the SXSW Interactive invasion of Ausin, Texas, Simon St. Laurent returns from this year’s Fluent Conf. They both talk about tech trends they saw from their respective points of view. Zell Liew is a writer, freelance web designer & developer based in Singapore. His down-to-earth articles — especially those recently published on the topic of responsive typography — make it easier to understand for both designers and developers. Allison <3’s CSS. She has worked at Happy Cog as a UX developer for over 6 years, building sites for high-profile clients such as Nintendo, MTV, Harvard, Ben & Jerry’s, and Shopify. She specializes in architecting custom front-end frameworks designed to scale and integrate. She lives in Philadelphia and enjoys traveling, outdoor running, and #konmarie in her spare time. This week we talk to Chris Enns, a freelance web designer and podcaster. He runs his own solo web shop Lemon Productions from Saskatoon, Canada, as well as produce shows for the GoodStuff.fm podcast network. Simon St. Laurent is back to talk about #Snowpocalypse, camera drones in NYC, the legacy of our work, and owning your own stuff —except for those conversations we have on Facebook. We take a look at what we saw this past month in the web space (and more) and what we think is happening on the horizon as we slip further into 2016. The Round Table from the SVG Summit has hosted by CSS Tricks’ Chris Coyier. It’s both a recap of the SVG Summit talks that happened before it and a Q+A panel with some special guests from the SVG community. Brenda Storer is a Designer & Front End Developer at ThoughtBot and Instructor at Girl Develop It. Web designer and author, Jeffrey Zeldman, publishes A List Apart Magazine, A Book Apart, co-produces An Event Apart, and hosts the Big Web Show. He writes at his blog, Zeldman.com. Sarah Drasner is an award-winning Senior UX Engineer at Trulia and a staff writer at CSS Tricks. Recently, she won Best Presentation at CSS Dev Conf 2015 aboard The Queen Mary. For our 2015 wrap-up we’re presenting a special recording of the CSS Dev Conf 2015 Wrap Up Panel with lots of great questions from the audience for the amazing array of speakers. We gather together to share some figgy pudding and talk about the things we’re proud of from 2015 with special guest stars: Ethan Marcotte, Greg Storey, and Molly E. Holzschlag! Annette Priest is a UX strategist and experienced designer and researcher. Her work spans device types and industries: mobile, IoT, health, travel, communications, security, finance, and government. She stops by the show to talk tips for UX research and tools you should have along. Ben Brown from Austin, Texas joins us to talk about Howdy - a bot he’s building for the popular Slack communications tool. This episode we have Elyse Holladay. Elyse’s been at Sass Summit and also a local Austenite—very glad to get a chance to talk to her today. We talked about organizing a physical conference, how she got into the web, of course, passion for work, and diversity in conferences, new speakers, a lot of topics. Sam Richard, UI Architect for IBM Watson, part of the awesome design team, where he waxes philosophical about Sass+Compass, Responsive Web Design, Drupal, Photography, and, on occasion, bacon. Richard got his start with the New York State Senate and the World Economic Forum which instilled a great love for Open Source, Open Government, and an Open World, which caries on to this day. Matt is the Editor-in-Chief at Marketing Land & Search Engine Land so we pick his brain about all things SEO - the white hat side SEO. And what’s up with all those Pandas that Google keeps releasing? Margot Bloomstein joins Christopher and Sam to talk about content strategy for your brand, website, or new corporate marketing white papers. For our special 50th episode, we provide you with the amazing team-up of the wonderful Sam Richard, UI Architect Watson at IBM Corporation, and your host, Christopher Schmitt. Sam and Christopher had the privilege of speaking at SXSW! They took on infamous bug reports and forum discussions around the Web the only way one can : dramatic reenactments! Simon St. Laurent joins Christopher to talk about content blocking, cookies, and publishing on the web in 2015 all prompted by the recent additions to iOS 9 on iPhones and iPad and El Capitan on the Mac. A regular code contributor and speaker at worldwide open source events, Micah Godbolt is highly involved in teaching and training new developers, sometimes as a guest lecturer at local colleges. He leads a Sass and front-end meetup in Portland and publishes a weekly video blog called Sass Bites. Our talk with Steve Fisher covers the gamut of content strategy, project discovery and open source projects. Sam gets lost in Encarta and Christopher has issues with Canadian pronunciations of words. Our guest for this episode is Jen Simmons and your hosts Christopher Schmitt and Sam Kap talk with her about where we’ve come from and where we’re going with the web. It’s changed a lot and it continues to change. For our annual year end spectacular we invited Dave Rupert, 1/3 of Paravel, over to chat with Christopher and Sam about what they saw in 2013 and what we can expect in 2014. We also check in with a couple of past guests, Rachel Nabors and Jonathan Snook, about the year that was and the year that will be. 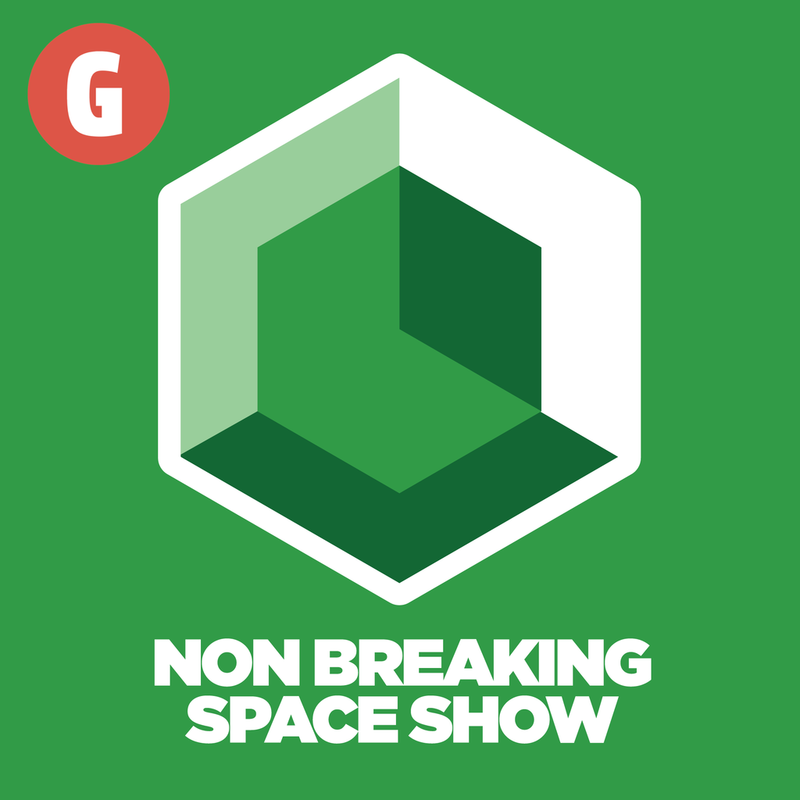 Pour yourself some rum and eggnog, find a mistletoe and kiss your podcast player while you bask in the 2013 Year End Spectacular from The Non-Breaking Space Show. Our talk with Jeremy runs the gamut of the web - progressive enhancement, depending on a database, sirens, the death of web services, the telegraph, transcriptions, CERN and preparing for a great talk. Jared Spool is a writer, researcher, speaker, educator, and an expert on the subjects of usability, software, design, and research. He is the founding principal of User Interface Engineering, a research, training, and consulting firm specializing in website and product usability, and the largest usability research organization of its kind in the world. Shawn Michael O’Keefe is at the forefront of emerging technologies as a producer for the South by Southwest (SXSW) Interactive Festival in Austin, Texas. Beginning his passionate journey into technology at the University of Texas at Austin, he focused on convergent media in the innovative and unconventional Advanced Communications Technologies Laboratory (ACTLab) before joining the SXSW team in the year 2000. Jonathan Snook is a web designer and developer who is currently a product manager at Shopify. Before Shopify, he worked at Yahoo! as part of the team that redesigned and rebuilt the communication suite of products: Mail, Messenger, Calendar, and more. Before that, he freelanced for almost 5 years working with fantastic clients on fun projects doing design, front-end development, and back-end development. Our guest for this episode is Val Head who is a designer and consultant based in Pittsburgh where she works with agencies and small businesses to make fun and effective web sites. Our guest for this episode is Scott Kellum who is a designer at VOX Media creating beautiful features for The Verge and also worked on SB Nation and Polygon. Our guest for this episode is Matt May who is a developer, technologist, and accessibility advocate at Adobe. Matt May is a developer, technologist, and accessibility advocate who is responsible for working internally and externally with Adobe product teams and customers to address accessibility in Adobe products, ensure interoperability with assistive technologies, and make customers aware of the many accessibility features that already exist in Adobe products. Prior to joining Adobe, May worked for W3C/WAI on many of the core standards in web accessibility, led the Web Standards Project’s Accessibility Task Force, helped to architect one of the first online grocery sites, HomeGrocer.com, and co-founded Blue Flavor, a respected web and mobile design consultancy. Daniel has been working in the web industry since 1997 and currently consulting, open sources, and speaking at various conferences. Rachel Nabors is self-employed front-end developer and UI engineer. She works on bringing the insights of comics and cartoons into the field of web development. Gio has a BFA in painting and has completed a degree in graphic design. He is an accomplished illustrator and designer. He’s a designer at Period Three, a web design firm in Columbia, South Carolina. He also helps organize the web conference, ConvergeSE, and has is own podcast, Draft. He’s also the author of The Web Designer’s Roadmap from Sitepoint. Glenda Sims is an accessibility consultant, speaker, author and trainer for Knowbility, a non-profit whose mission is “barrier free IT”. She works at Deque where she is a Senior Accessibility Consultant. There she shares her expertise and passion for the open web with government, educational institutions, small businesses and Fortune 500 companies. She performs hands on web accessibility assessments, develops accessibility roadmaps and strategies, and consults with developers and designers. Jon is an Engineer and Designer at GitHub. He recently spoke at CSS Dev Conf in Hawaii on Github CSS Performance. Ryan is presently the Vice President of Technology at Happy Cog. He’s also the owner of Mijingo, a publisher of training materials for web people. Ryan is also the publisher of EE Insider.com, a news and information website about Expression Engine. He’s also the author of ExpressionEngine 2: A Quick-Start Guide. Our guests for this episode are the hosts of the BizCraft, the podcast about the business side of web design, Carl Smith of nGen Works and Gene Crawford of UnmatchedStyle. Gene Crawford is the Editor for unmatchedstyle.com, organizer of convergese.com. President AIGA South Carolina and he also runs Period Three. Carl Smith is the founding member of nGen Works. He has worked with some great teams that won the New York Art Directors Award for Interactive Development, The Hospitality Industry’s Best of Show Award, and two National C.A.S.E. awards for Educational Web Development. Featured in Kelly Goto’s best-selling book, Web Redesign: Workflow That Works. Jennifer Robbins has been a Web designer since 1993. She designed the web’s first commercial site, O’Reilly’s Global Network Navigator. A graduate of the University of Notre Dame, Robbins is the author of Web Design in a Nutshell, Learning Web Design, and HTML and XHTML Pocket Reference. She has also written corporate identity style guides for clients such as Harcourt Publishing, Americanexpress.com, and Orange Imagineering. Since 2000, Jennifer has lived in Providence, Rhode Island, where she has worked as a freelance designer, teacher, lecturer and consultant through her company Littlechair, Inc.
Jennifer has taught at Johnson & Wales University and at the Massachusetts College of Art and is now a product designer for O’Reilly Media. Chris is well known for his screencasts and tutorials at CSS Tricks.com. Previously he worked for Wufoo and Survey Monkey. Dan is a designer, author, speaker, husband, and father living in Salem, Massachusetts. He is the Founder and Principal of SimpleBits, LLC, a tiny web design studio, and co-founder and designer of Dribbble, a vibrant community for sharing screenshots of your work. Dan is a recognized expert in the field of standards-based web design and has worked with YouTube, Microsoft, Google, MTV, ESPN, and others. He has authored four books including “CSS3 For Web Designers”, “Handcrafted CSS”, “Bulletproof Web Design”, and “Web Standards Solutions”. In early 2012, he received a TechFellow award for Product Design & Marketing. Dan enjoys sharing his simplistic approach to web design while spreading the word on the standards-based markup and style techniques he’s collected by speaking at conferences and events around the globe. Veerle is a Belgian web and graphic designer, known throughout the world for her elegantly designed web projects, her tutorials promoting CSS, and her articles and blog posts on graphic design, web design, and modern home design. In 2000, she founded Duoh! with Geert Leyseele. They choose their projects based on how well they connect with a company, and have worked on everything from ExpressionEngine 2.0’s GUI to innovative, creative projects for the Library of Congress and sites for businesses large and small. Tab Atkins works for Google on the Chrome team, claiming that his position is “Web Standards Hacker”. Previously, he was a web developer for for a software company in Texas. Tab is also a member of the CSS Working Group, and participates in several other W3C groups as either a member or a contributor, including the HTML and Fonts Working Groups. With client list that includes Wes Anderson, Tiffany & Co., The New York Times, Target, American Express, and Wired Magazine, Jessica Hische is a letterer, illustrator, and self-described “avid inter netter”. Always pushing for side projects, Jessica’s publishers her own micro-sites that include Mom This is How Twitter Works, Should I Work for Free? and Don’t Fear the Internet. Jina Bolton is an interactive designer and artist, working and residing in Silicon Valley. She co-authored The Art & Science of CSS. Jina has consulted for various agencies and organizations including the W3C Web Accessibility Initiative and Mass.gov. She holds a BFA in Computer Arts and Graphic Design from Memphis College of Art. Matt is a designer and one of the founders of Bearded. He has a great love for letterpress printing, and is an advocate for collaboration in design, and has been published in A List Apart and .net magazine. Matt’s one of the creators of Wood Type Revival, a successfully Kickstarter-funded project which seeks out lost historic wood type and converts it into digital fonts for modern designers. Mat works at The Filament Group in Boston, a company that designs engaging sites and apps for mobile, tablet, and desktop platforms. He is a designer and a developer who occasionally works independently with big-time clients like The Boston Globe. Mat also regularly writes articles for the A List Apart blog. He is a member of the jQuery Mobile team, and also an active member of the open space community at movethewebforward. In addition, Mat chairs the Responsive Images Community Group. Jason is a Mobile Web Strategist. He’s the co-Founder of CloudFour where they live, breathe, and dream the mobile web and Mobile Portland, a non-profit organization dedicated to educating, promoting and supporting the mobile technology community. Jason is also the Co-Author of Head First Mobile Web. Nicole Sullivan is passionate about CSS, web standards, and scalable front-end architecture for sites with large numbers of pages and visitors. She speaks about performance at conferences around the world and has enjoyed working on large commercial sites. She writes on her blog as well as other industry developer sites. Lou is an independent information architecture consultant, and founder and publisher of Rosenfeld Media, a publishing house focused on user experience books. He has been instrumental in helping establish the fields of information architecture and user experience, and in articulating the role and value of librarianship within those fields. Samantha Warren is an experienced designer, speaker, and writer who leverages a diverse background in artistic mediums to create compelling and functional web experiences. Currently, Samantha is the Communications designer at Twitter. She talks about design and the web on her blog, BadAssIdeas.com, and spends time with her cross-eyed cat, Grace. Eric has been working with the web since late 1993 and is an internationally recognized expert on the subjects of HTML, CSS, and web standards. A widely read author, he is the founder of Complex Spiral Consulting, which counts a wide variety of corporations, educational institutions, and government agencies among its clients. Eric, along with Jeffrey Zeldman, is the co-founder of An Event Apart. Brian is a graphic designer living in Brooklyn, New York who loves creating compelling and useful websites and memorable interactions across the web. When he’s not designing, he can be found writing, speaking and occasionally part-time teaching at colleges — all on the subject of design. Aarron has been building websites professionally since 1999, and taught interactive design courses at colleges including Temple University, The University of Georgia, and The Art Institute of Atlanta since 2002. In 2007 he joined The Web Standards Project, and for three years lead the development of the InterACT curriculum project – an open curriculum designed to bridge the gap between the Web industry and education. Aarron is the lead user experience designer at The Rocket Science Group – makers of MailChimp, and is the author of Building Findable Website and Designing for Emotion. Kristina lives in St. Paul, Minnesota with her two young children, whom she often quotes on Twitter. She is the founder and CEO of Brain Traffic, a world-renowned content strategy consultancy. She’s also the author of Content Strategy for the Web (2009)– recently out in its 2nd Edition, and is the founder of “Confab The Content Strategy Conference”. Kristina is widely recognized as the industry’s leading advocate for content strategy. In 2009, she curated the first Content Strategy Consortium to facilitate a national dialogue about this emerging discipline. Today, Kristina speaks regularly to audiences around the world and is well known for her energetic, often humorous talks. Our guest for this episode is Rachel Andrew. Rachel is a web developer, speaker and prolific author. Her new book, the CSS3 Anthology was just released by Sitepoint. She’s also the founder of the web development agency, edgeofmyseat.com. Brad is a mobile web strategist and front-end designer at the digital advertising agency R/GA in New York. He’s also the creator of a Mobile Web Best Practices site, and one of the creative minds behind WTFMobileweb.com and wtfqrcodes.com. Greg is the president of Happy Cog, an industry-leading, diverse group of problem-solving superstars, united under the common goal of making the web a better place to think, work and play. Greg writes on his own blog as well as Happy Cog’s Cognition about business practices, design and the intersection of the two in the real & digital world. Our guest for today’s show is Jeff Croft, a designer and developer working out of his home in Seattle. He works at the web agency nGen Works and he’s also a blogger, speaker, critic, and industry thought leader. Jeff is the co-founder of the popular eBook sharing community, Lendle.me, he’s co-authored two books, Pro CSS Techniques, and Web Standards Creativity. He has been working on the web full-time since 1995. While Jeff does plenty of programming, his true passion lies in design, user experience, communication, and social media. Our guests for our fourth episode are Chris Coyier and Dave Rupert, the hosts of the popular web design podcast Shoptalk. Chris is well known for his prolific posts and screencasts at CSS-Tricks.com. He’s a designer for Wufoo.com, speaker on all things web. Dave Rupert is the lead developer for Paravel, a web design and branding agency located in Austin, Texas. Our guest for episode 3 is Emily Lewis. Emily creates beautiful, accessible, standards-based web sites from her web design and development studio based in Albuquerque, New Mexico. As part of her ongoing quest to spread the good word about standards, she writes about web design on her blog, A Blog Not Limited, and is the author of Microformats Made Simple and a contributing author for the HTML5 Cookbook. Paul is a front end developer and works on the Chrome Developer relations team at Google. He’s a member of the jQuery team, and a lead developer on Modernizr and HTML5 Boilerplate. He’s also the creator of the sites MotherEffingHSL, MotherEffingTextShadow, and a bunch of mother effing other sites. Ethan is a web designer & developer who lives in Cambridge, Massachusetts. He’s also the author several web design books including Responsive Web Design, a book that’s helped revolutionize the way websites are built. He frequently speaks on web standards and responsive web design at conferences and tweets about it @beep and @rwd.